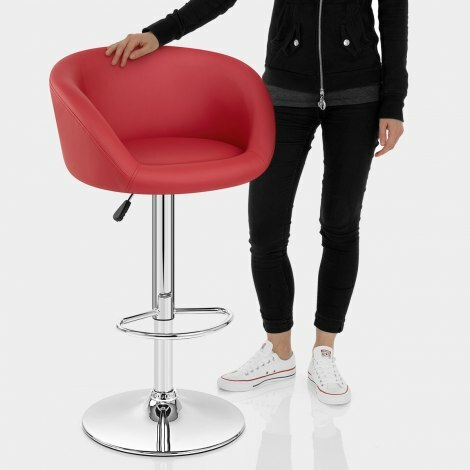 The Eclipse Bar Stool Red is a design that will stand the test of time, with a free flowing simplicity that allows it to be used with any decor in any location. 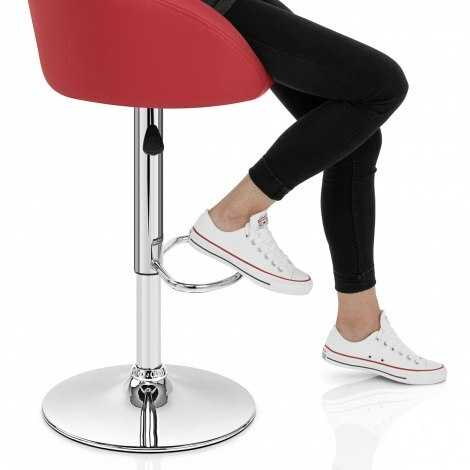 Beautifully bold, the Eclipse Bar Stool will take pride of place in your bar area and make a real statement. The Eclipse possesses a seat covered in vibrant red faux leather and is padded for extra comfort, The backrest and armrests extends around the seat, which assists in propping you up to ensure support and comfort. The seat stands on a chromed pillar and benefits from variable height adjust capability through the gas lift and 360 degree swivel. On the pillar is the footrest, hand crafted from chrome plated tubular steel and provides an ideal location to place your feet. A rounded base finishes off the package, coming with a protective ring beneath that helps to protect your floor. "Very comfy the shade of red is really good"
Fantastic stools, far superior to the cheap £75.00 pair from Ebay 2 yrs ago better padding and all round better stool and very fast delivery GREAT. These are good quality sturdy stools, at an affordable price. I was pleasantly surprised at how easy they were to put together. The full padded seats make sitting very comfortable. Fast delivery service, with clear ETA updates which accurately narrow down the time they arrive, freeing my busy day and being able to plan making the whole process from start to finish a smooth and pleasurable experience. I would recommend this company and use them again. A lovely product which ticked all the boxes and was delivered promptly and in perfect condition ! Would use your company again.